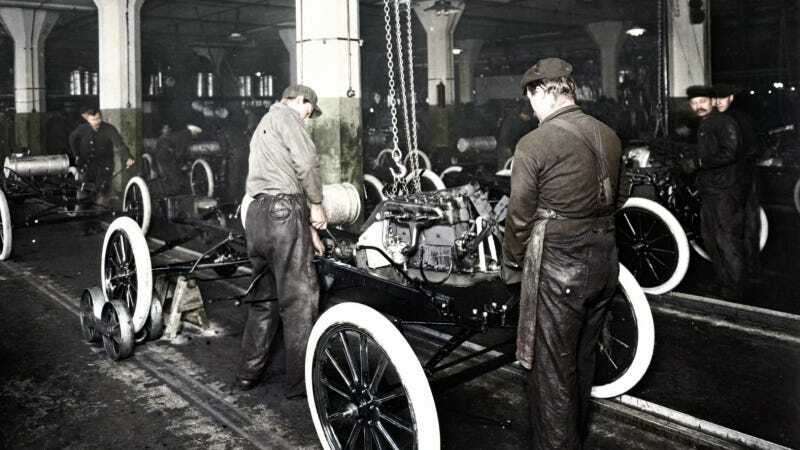 As today marks the 100th anniversary of the moving assembly line invented by Ford Motor Company under the leadership of Henry Ford, the company is building on its legacy of innovation by expanding advanced manufacturing capabilities and introducing groundbreaking technologies that could revolutionize mass production for decades to come. Ford is rapidly expanding its advanced manufacturing capabilities and boosting global production to meet surging consumer demand. By 2017, Ford will increase its global flexible manufacturing to produce on average four different models at each plant around the world to allow for greater adaptability based on varying customer demand. Ford also projects 90 percent of its plants around the world will be running on a three-shift or crew model by 2017, which will help increase production time more than 30 percent. Also in 2017, virtually all Ford vehicles will be built off nine core platforms, boosting manufacturing efficiency, while giving customers the features, fuel efficiency and technology they want anywhere in the world. Today, Ford builds vehicles on 15 platforms and has the freshest lineup in the industry. Ford’s recent expansions in global manufacturing and production have helped to retain 130,000 hourly and salaried jobs around the world. One hundred years ago today, Henry Ford and his team at Highland Park assembly plant launched the world’s greatest contribution to manufacturing – the first moving assembly line. It simplified assembly of the Ford Model T’s 3,000 parts by breaking it into 84 distinct steps performed by groups of workers as a rope pulled the vehicle chassis down the line. By reducing the money, time and manpower needed to build cars as he refined the assembly line over the years, Ford was able to drop the price of the Model T from $850 to less than $300. For the first time in history, quality vehicles were affordable to the masses. Eventually, Ford built a Model T every 24 seconds and sold more than 15 million worldwide by 1927, accounting for half of all automobiles then sold. In 1914, Ford instituted the “$5 workday,” a significant wage at the time, to enable his employees to buy the vehicles they built. The move created loyalty among Ford workers and is credited with giving rise to a new middle class of consumers unencumbered by geography, free to travel the open roads, to live where they please and chase the American dream. Ford fans today are honoring Henry Ford and his ingenious moving assembly line. National Geographic Channel will mark the occasion with an in-depth new documentary as part of its “Ultimate Factories” program airing Friday, Oct. 18. Information about the documentary and local air times can be found here. For additional information, graphics, images and video on Ford’s moving assembly line, please visit media.ford.com. Ford already is realizing the benefits of advanced manufacturing technologies that will shape the future. For example, Ford engineers are developing a highly flexible, first-of-its-kind, patented technology to rapidly form sheet-metal parts for low-volume production use. The technology, known as Ford Freeform Fabrication Technology, or F3T, will lower costs and speed delivery times for prototype stamping molds – within three business days versus two to six months for prototypes made using conventional methods. Additionally, Ford is expanding its capabilities in 3D printing, which creates production-representative 3D parts layer by layer for testable prototypes. With 3D printing, Ford can create multiple versions of one part at a time and deliver prototype parts to engineers for testing in days rather than months. Ford also is investing in robotic innovations to improve vehicle quality and production efficiencies. For example, the company’s new dirt detection system uses robotic vision to create a digital model of each vehicle in final assembly to analyze paint and surface imperfections in comparison with a perfect model. The result has been significantly improved surface quality on Ford vehicles and more time for operators on the assembly line to address complex issues. Robotics, in this case, allow Ford to work smarter in improving products for customers and allowing workers to focus on more critical thinking tasks. Finally, through Ford’s “virtual factory,” the company can improve quality and cut costs in real-world manufacturing facilities by creating and analyzing computer simulations of the complete vehicle production process. This includes simulations of how assembly line workers have to reach and stretch when building a vehicle to ensure the work conditions meet Ford ergonomic standards. Since the implementation of this virtual process in 2001, the number of ergonomic issues during physical builds has been reduced by nearly 20 percent.